Eidon Joint Supportis a combination of silica and sulfur, both essential for joint health. They are the active mineral ingredients in glucosamine sulfate and chondroitin sulfate. Silica and sulfur are the two most important minerals required by the body to produce glycosaminoglycans, the main building blocks of collagen and connective tissue. Unfortunately, today's average diet does not provide us with anywhere near an adequate amount of either of these minerals. Consequently, a dramatic increase is being seen in all sorts of problems related to joints and connective tissue. Eidon's Joint Support was formulated to provide you with adequate amounts of these two elements in a highly bio-available format. It is tasteless, odorless, and easy to drink. What Eidon has accomplished is to isolate the two minerals in glucosamine sulfate and chondroitin sulfate: silica and sulfur. Silica and sulfur are the catalysts involved in activating the essential enzymes responsible for repairing and regenerating collagen and connective tissue. 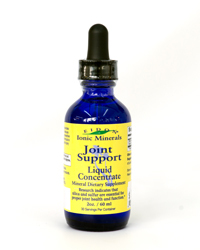 Joint Support is derived from minerals which have already been broken down to a minimal molecular size for easy absorption unlike other plant/animal based supplements which the body must break down prior to absorbing. As you continue supplementation, you may also begin to notice other benefits such as improved digestion, stronger teeth and gums, stronger bones, improved skin tone and stronger hair and nails. This formulation is also useful for heavy metal detoxification. 1 x Tray 10x10x2.25 in.